SOCIAL PROTECTION MINISTER Joan Burton has said that it is in everybody in the country’s interest that the government and public sector unions agree a deal on pay and conditions. She was speaking ahead of tomorrow’s deadline for the chairman of the Labour Relations Commission, Kieran Mulvey, to report to government on whether or not it will be possible to reach a deal that saves €300 million in the public sector pay bill this year. She said that it was important that government was conscious about “protecting the maximum number of jobs” within the context of exiting the Troika bailout later this year and said she remains “hopeful” that a deal will be reached. Unions have been at odds with government over reforms to public sector pay which are aimed at saving €1 billion over the next three years having voted against proposals to cut premium pay, extend working hours, and cut pay for higher earners. Some trade unions have already begun balloting for industrial action with the government indicating that if it cannot reach a deal with workers it will legislate for pay cuts. Earlier this week, Public Expenditure and Reform Minister Brendan Howlin told TheJournal.ie that sector-specific deals were a possibility as an alternative to an overarching agreement as had originally been proposed and voted down by unions. Burton insisted this afternoon that the government proposals had been made in a “balanced way” and that Howlin had sought to confine reductions in pay to those earning over €65,000. “We want to maintain employment and we want to do that in the best way possible,” she said. Speaking on the same programme, the Sinn Féin TD Peadar Toibin said the “workers had nothing left to give” while the Fianna Fáil TD John McGuinness said the whole process of social partnership isn’t working. “The civil service looks in the mirror and negotiates with itself, it’s wrong,” he said. Email “Joan Burton: In everybody's interest that we get a public sector pay deal ”. 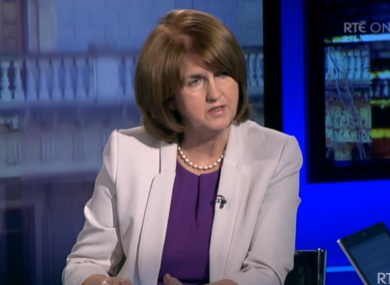 Feedback on “Joan Burton: In everybody's interest that we get a public sector pay deal ”.